Eriastrum sapphirinum - Pronunciation: er–ee–AS–trum saf–ir–EYE–num — is a member of the phlox family known by the common name Sapphire Woolly Star. 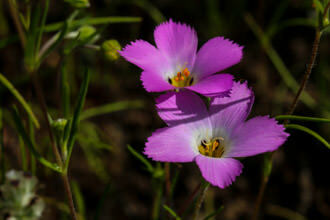 This annual wildflower is endemic (found nowhere else!) to California where it is found in a variety of habitats - from the desert to the sea: Santa Monica Mountains, Anza Borrego, Angeles National Forest, Orange County and San Diego County. This plant can be as short as 5 centimeters or as tall as 40 centimeters. The plant takes two different kinds of form: clumps or singular spindly stems. 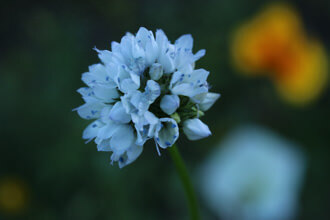 The funnel-shaped flowers have five lobes each, one half to one centimeter long and pale to bright blue. The throat of the flower is the same color or yellowish to white. At the mouth of the tube there may be dots of yellow and white. The light colored stamens extend upwards about a half a centimeter. The stem is erect and can be reddish to green. Careful examination will also show the ‘Wool’ referred to in the name - just below the petals are some fuzzy filaments that resemble wool. 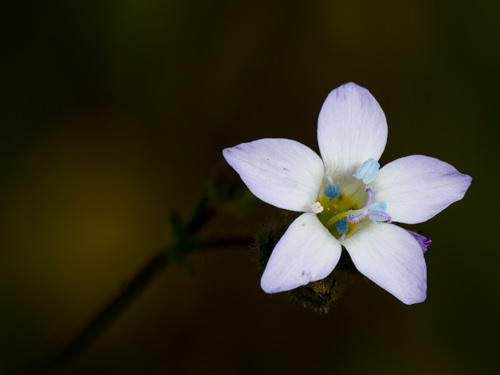 This Sapphire Blue flower is small, so small that you are likely to stride by without even noticing them. One of the images above shows me photographing these flowers and it is very difficult to see that there are indeed flowers in the frame — if you maximize the image you just might see the flowers. 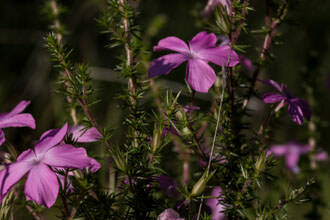 Like any native wild flower in our mountains they have a place and a purpose beyond just their beauty. Butterflies like the Hairstreak visit this plant to feed on its nectar which in turn pollinates the flower. The best way to find these flowers is to look for flowers on the edge of the trail. Some times you will not see them in one direction but will in another. This might have something to do with the reflection of light. The plants grow in isolated but dense populations and seem to favor hard-packed soil - the edge of trails in chaparral. 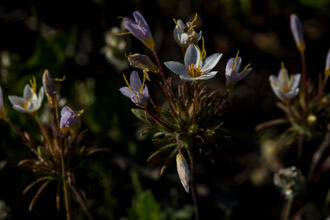 The flowers are tiny but when a group of them is in bloom they make up in vivid color what they lack in size. Two places where I have seen these flowers: Backbone Trail between Corral Canyon and Latigo Canyon and the Pentachaeta Trail in Westlake. 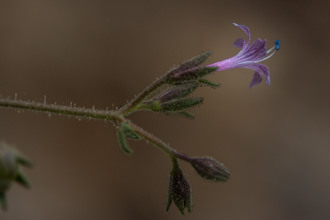 Found on CalFlora.net a wonderful site for native plant information. Last modified: March 31 2017 21:31:55.